Provides a secure anchor to any work surface. Convenient to use means no more searching for a strong anchor point under your desk or workstation. Attractive design complements modern office décor. Tamper-resistant features include 2 one-way security screws and full steel construction prevents cutting. Industrial strength mounting tape provided for situations where screwing holes is not an option. 3.5" (L) x 1.75" (W) x 0.5" (H Ring Down) or 2.25" (H Ring Up). 3M VHB industrial adhesive tape - 2 square inches. Full steel construction base plate and ring with corrosion resistant chrome plating. 2 x ¾" one way slotted security woodscrews (self drilling) for maximum security. 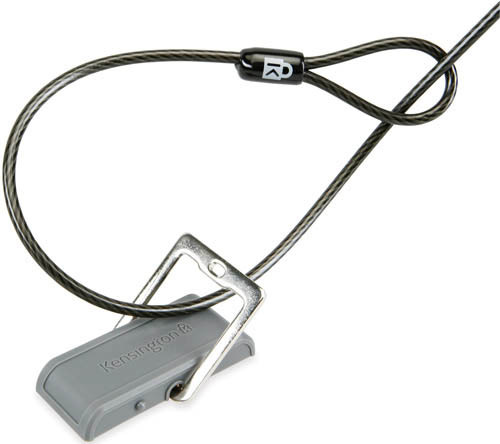 Fold flat ring stores out of the way when not in use and accepts Kensington MicroSaver and ComboSaver Laptop locks.